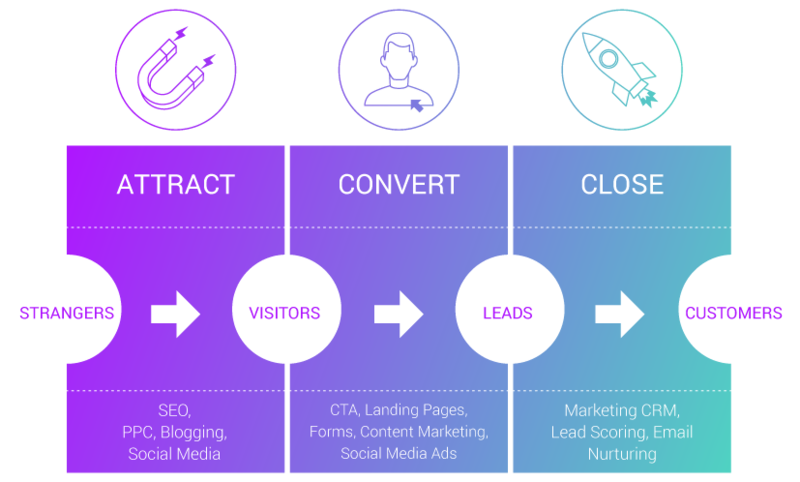 A quick and easy answer of what inbound marketing is, followed by more in depth explanations of all the ins and outs, supplemented with related blogs and videos. This post was originally created on April 13th 2015 - we have recently reviewed the content and updated it to make it even more useful. Inbound marketing involves producing and sharing quality content (blogs, videos, eBooks, infographics), for free, to attract future customers to your business when they search the internet. You market your business by earning a Lead's trust. When the time comes to make a purchase, they already have a relationship with you so are more likely to choose your company. Instead of wasting valuable time and money on outbound techniques (billboards, interruptive advertising, directory ads), inbound marketing attracts visitors at the right time by providing content aimed at solving problems they are facing at the time. This includes: How-To guides, advice blogs, case studies... internet users search for content which helps them at their own particular stage of the Buyer's Journey. With inbound, your company has provided content for all scenarios and earns their trust enough to win their business. 3. Why Has Buyer Behaviour Changed? 5. Who Exactly Is Your Customer? 6. 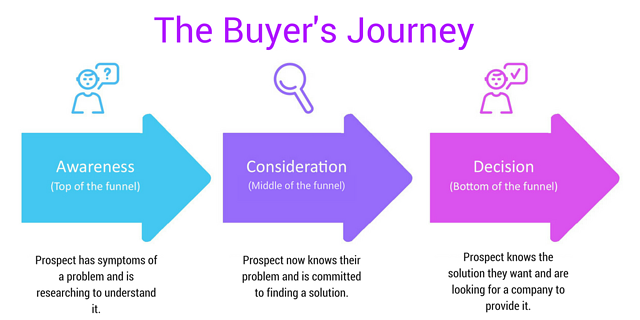 What Are The Different Stages Of The Buyer's Journey? 2. Where Did Inbound Marketing Come From? Advances in mobile technology has meant that user habits have changed. Prior to purchase, most consumers will conduct some form of research to either try and solve an issue themself or find the best paid solution. This is in contrast to the traditional means of passively being advertised at by producers (who would hope to spark a desire in their audience or get lucky with some consumers seeing the ad at the right time). These methods are interruptive (like advert breaks on television or radio). They usually appear out of context (like an advert for watches alongside a magazine article about cooking). And leave would-be consumers feeling annoyed or get skipped entirely (flicking the magazine page over or fast-forwarding the advert break). Although still used today, they return declining results as consumers are now content aware and can quickly research solutions to problems themselves - something which has disarmed the traditional advertising industry. The inbound methodology recognises changes in buyer behaviour, and recognises that marketing has had to change too. 3. But Why Has Buyer Behaviour Changed? The internet - more specifically, high speed internet - and mobile tech created a vacuum in the perceived knowledge base of the consumer. Whilst sales traditionally involved someone explaining a product to you, in a way that encouraged you to buy - this new state of play now involves customer research into factors such as online reviews. The salesman is often now less educated about his product than those he is selling to. Or the consumer at least feels this way; which is effectively the same thing. As this ability to discover information increased, traditional methods of marketing became more and more inconvenient, unhelpful and down right annoying. This era of frustration paved the path for Inbound. The buyers now hold all of the power, not the seller. The buying process is now massively weighted on research and reading up before a purchase decision is made. So, what’s the solution for your business? How do you connect with these research based buyers? It means using the inbound methodology. The inbound methodology is no longer a shiny new concept. Although still in its infancy compared to outbound/traditional advertising, inbound is now used throughout the world, by Leading marketers, as a first choice method. The methodology completely covers the end-to-end buying process (or Buyer’s Journey). The idea being that you can connect with someone before they are ready to buy and offer them timely, valuable insight, through remarkable and shareable content. This earns their trust. By engaging someone during their research process, offering them the answers and continuing engaging until the buying decision is to be made - your business is at the forefront of the buyer's mind. And you always stand a better chance being of chosen as the service/product provider. In order to work effectively, this relies on understanding your customers. 5. But Who Exactly Is Your Customer? This isn't just about creating ideal customers or target markets, in order to engage fully with potential consumers and customers, you need to shape a wholly encompassing buyer persona. This takes into account what your customers/clients will struggle with in terms of what you can help with, but also in other areas. Where and when they conduct online research. What forms of content they enjoy. Which social channels they hang out on. All of this allows you to shape your content so that it really appeals to them and they enjoy turning to you for answers. By creating a buyer persona, you can create in-depth personal profiles of who your audience is. Once you understand how they like to behave, think and act, you can begin to create marketing messages that will talk to them on a much more personal level. Once you have an accurate buyer persona, you can begin to create content which appeals to them at the different stages of the Buyer's Journey. This means that, whatever stage an internet user is at in the Buyer's Journey, when they search for information/advice/ideas/potential purchase choices, you can engage with them. Someone then thinking "Oh, this blog post is aimed at people who don't know anything about this topic, but I know a fair bit already" isn't an issue, because your downloadable template allows them to start planning the next step. They are Awareness, Consideration and Decision. At any one time, a consumer or potential consumer is somewhere in this journey. After you create your buyer personas, you’ll have a better understanding of your ideal customer, as well as the customer you are best placed to attract. This will allow you to create personal content that directly engages with these people. If your customer is thinking, "Wow, they know exactly what I’m going through" - you’ve nailed it. Let's delve further into each stage. 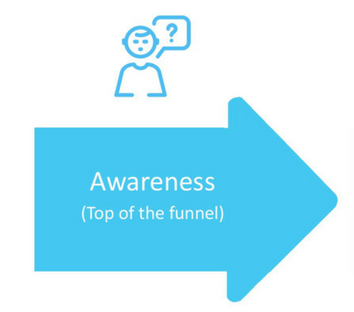 Consumers in the Awareness stage are aware or just becoming aware that they have some sort of problem and they want to research more about the problem, so they can fully understand it. They are also likely to be thinking ahead about potential solutions. Their car finance could be up for renewal in a few months and they might want to extend the loan rather than trade-in their vehicle. They might be sensing their boiler is on its last legs and be looking into ways of extending its life until after Christmas. Their office staff might be suffering from low morale and they aren't sure why. Your content aimed at this stage of the Buyer's Journey should offer further information on why the problem has come about, what could have stopped it happening, general advice... and aim to move them onto the next stage of the journey. 7. That's Great, But, How Do You Attract Potential Customers Via Inbound Marketing? You might be wondering how you get people to see your answers to their problems. And how to present your answers to them. We've spoken a lot about "attracting" visitors and "engaging" with them at the different stages of the Buyer's Journey, but what does this look like? What forms does this free content take? A blog on your website should answer common questions, educate users with ‘how to’ articles and share industry insights. It is the place which many of your consumers will become familiar with your business, so it needs to speak to them in an engaging way. It gets found via search engine queries, so will also be a big tool in your SEO toolkit. Search Engine Optimisation makes sure your website copy and content is primed to help people arrive at your site via search engines (Google, Bing, Yahoo, etc). It's a special process which looks into predicting "keywords" which people enter into search engines so that search engines know your page/site can help with that query. There's more to a professional SEO campaign (backlinks, domain authority, on page and off page SEO), but the core aim is to make sure your site is primed for engines to know what it's about and put it in front of the right users. Pay Per Click advertising, paid ads, paid posts... it should all form part of a full inbound marketing package. Some inbound agencies try to state that inbound doesn't use paid advertising, but we don't want to hide the fact that properly executed paid advertising is great for boosting your inbound marketing. Paid posts which still follow the inbound methodology and ethos (to help users and solve issues to earn their trust) by using inboundy ads help put you in front of more users in all paid areas: SERP ads, remarketing, paid social posts, pixel ads, Adwords, Display ads. This is a major part of inbound marketing because it is where you share your content and reach new audiences whilst the effects of PPC and SEO take hold. Outreach via #hashtags, communities, groups and social sharing help to put your content in front of a wide as possible audience. Going back to producing helpful and insightful content; people are more likely to share your content which is useful and enjoyable to their followers and friends, which increases your reach. Writing useful content on your website’s pages and making more of it is a part of inbound too. It highlights your business’ purposes, clarifies your services and helps to create permanent content to engage with target personas on a personal level. Remember your tone of voice should be appropriate for your customers, make yourself relatable and someone interesting to talk to so that when you give them answers and potential help they are more likely to listen. So you’ve attracted the right visitors to your website, what’s next? Now you need to convert these visitors into Leads by getting their contact information. After all, what’s the point in driving thousands of unique visits to your site if all they can do is have a look around and then leave? Offer them useful, free information and, in exchange for this kind gesture, they will be more willing to share their email addresses and other contact information you may need in order to contact them directly. Once you have satisfied a visitor's Awareness stage needs, it's the time to convert them into a Lead now that they will be Considering solutions in more depth. This is done by prompting them to engage with you in more interactive ways, as opposed to just consuming on-site content. Internal Links - linking to other areas of your site or other relevant blog posts help to establish trust in your business. It increases the amount of knowledge you are providing to visitors and therefore increasing the amount of time you have invested in each other. Call-to-Actions (CTAs) - these invite visitors to take an action, for example: "Download our FREE eBook", "Sign up for online course", "Join the community for insider tips". Once a user has consumed your blog, video or listened to a podcast, you should give them a CTA which helps them further; "If you want to read more on this CLICK HERE or if you're ready for more in depth figures PRESS THIS." Landing Pages - And a CTA should take you to specific Landing Pages. This is where the contact details can be submitted and users are less tempted to head elsewhere (thanks to the way it is designed). A good landing page makes all the difference. Use a striking image, use a big button, don't ask for too much information and they will submit their contact information and become a Lead. By collecting information in a fair exchange (a checklist in exchange for only a name and email address, for example), you form a relationship with a customer and have an in-road to market to this individual at a later date. By showing interest in a topic (downloading one of your great eBooks) you can be sure that this person is interested and ready to learn more. By qualifying Leads within a particular context, your marketing only goes to those that may want it. This saves you time and will instantly increase the conversion rate of your messages email marketing. This is far superior to generalised paid email or PPC campaigns. The best ways to discover information about your visitors are Contact Forms and a quality CRM (Customer Relationship Management) Tool. Contact forms - the quickest way to convert visitors. Create contact forms for people to fill in before downloading more in depth content from you. Call-to-Actions (CTAs) - these invite visitors to take an action, for example: "Download our FREE eBook", "Sign up for online course", "Join the community for insider tips". People need something to click, somewhere to go. Give it to them! Landing Pages - Landing pages are where someone goes after clicking your CTA. This is where the contact details can be submitted. A good landing page makes all the difference. Use a striking image, use a big button, don't ask for too much information. Because your contacts and Leads have been through all of the above processes, they are more likely to be closed into a Customer or Conversion. When they enter the Decision stage of their Buyer's Journey, they will have already trusted your Awareness stage content enough to submit an email address and seen your Consideration stage content shows you are a viable option. Once you have an email, and have received this in a way that tells you "I'm ready to hear more" - you need to start nurturing. Create relevant and beneficial content and send this directly to your Lead. Also offer them more free download content which helps move them closer to making a decision (more in depth eBooks, client case studies which present you as the best option). But also sending useful blog posts, helpful tips and offering them your services in a chain of informal emails - you can quickly build a relationship of trust. However, there is a skill to getting this right. Too little will make you forgettable, too much will be perceived as spam. By creating a well-considered, automated workflow of emails, you can gently nurture an individual into an informed position where you then know, at the end of the chain of emails, they will be either be ready to buy or at least speak to you about your product. Again, this will save you time and money and ensure you only pick up the phone when you need to. As briefly mentioned, an effective CRM system contains everything your sales or marketing team could ever want to know about a prospect. We prefer HubSpot. Using one can mean the difference between having context packed conversations with potential customers or turning up unprepared. Which would you prefer? Once your customer has used your service or product and they have been marketed to in a friendly, helpful and non-intrusive way; they are far, far more likely to become a promoter of your business. Especially when you keep them happy after conversion. With inbound, it’s important to keep delighting your customers after the initial sale. Your aim is to continuously engage your customers, to not only promote return custom but equip individuals to promote your service around the web. Keep Providing Relevant Content - create remarkable content that continues to inspire and engage with customers. Gather Feedback Surveys - every now and then send surveys to your customers, ask them what they want from you. If you are lacking a service, create one. Keep making your customers happy. Encourage Social Interaction - keep interacting with your customers online, people enjoy an interactive and personal service. If they enjoy engaging with you, they will want to buy from you. The inbound methodology promotes direct and personal interactions with your customers. People don’t want advertising shoved in their faces, they want relevant and friendly information that helps them achieve their goals. The return for this is that they are more likely to promote your business or product. Find out more about Inbound Strategies here. And this means that they will like and respect your business because, when they search for content to help and inform them, your content is what they've found useful and engaging. And relatable. As you continue to engage with customers via surveys, blog round up emails, social interaction and new content, you can recycle them through the Buyer's Journey and benefit from them being a Promoter. Every form of inbound marketing allows two-way communication. Sharing on social promotes discussion, blog posts and videos have commenting features, email marketing communicates on a one-to-one basis. Starting conversations is easy when following inbound marketing. As your target personas will be so well developed and users will be searching out your content, you will be able to engage with the full range of personalities and types of customer. The tone will be right, the length and format of content will be what they want and it will be aware of issues that affect them. Which establishes you as an authority, again, making people keen to promote you to their contacts and making up-selling your products and services easier. And this perpetuates to the point where you become a thought leader in your niche or industry. You will be able to lead with new ideas and shape the field you work in. So they will be easier to market to and more likely to convert. Which leaves you with less wasted spend and better ROI. So it will always be there to Attract and Convert visitors who you can nurture into becoming Customers. Each inbound marketing campaign just adds to the effect of those before it and helps the aforementioned benefits related to authority and becoming a thought leader. So, all of this slots together to make a full cycle. A person can become part of the inbound marketing process at any point in their personal Buyer's Journey stage. By providing the full range of inbound marketing materials and services, you will be able to carry on Attracting, Converting and Closing. Read more on why Inbound works. 9. Are You Keen To Try Inbound Marketing For Free? Don't just take our word for it, you can try out inbound marketing for free by using our free inbound marketing templates. We have put together a collection of templates to help you get started with personas, creating content and marketing to potential customers the inbound way. The days of junk mail are over. Whilst outbound still exists , the diminishing returns should be reason enough to stop. We can skip those TV ads, batch delete junk mail and avoid sites we know spam us. Not only does Inbound get you more Leads, it gets you the right Leads, every time. Already using Inbound or have any questions? Feel free to get in touch or post your question below.